Most of us have used either Microsoft PowerPoint or Apple Keynote so we've all come across the notion of grouping in-scene elements. Through grouping a presentation designer can collectively move, rotate and otherwise configure multiple elements at the same time. It is a very handy capability that power users turn to quite frequently. Intuiface also offers grouping but it does so in the form of a collection. Why a collection? Because unlike in presentation tools like PowerPoint and Keynote, grouping in Intuiface is just as - if not more - important at runtime as it is at design time. A Group collection is the key to creating forms, datasheets and other layouts comprised of multiple asset types - i.e. of the images, videos, documents and everything else Intuiface supports. To the right of the image below is what appears to be a product datasheet. 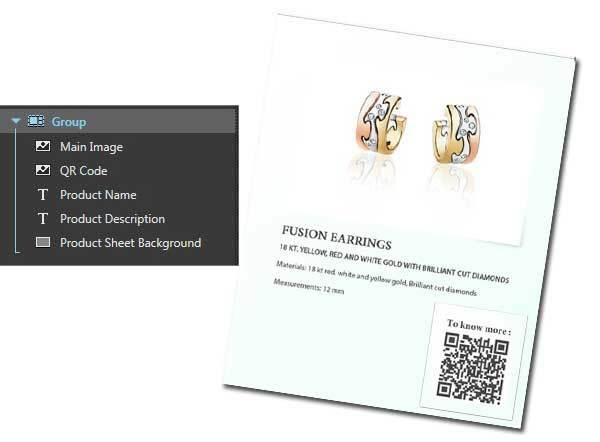 In it you see a product image, some text, a QR code and background coloring. To the left of the image you can see how this datasheet is actually a Group collection with a set of child elements. As children of the Group collection, these elements can be arranged in any layout required by the design. Perhaps more importantly, Group collections are the perfect data template. Using interfaces, bind each element to external data resources like Excel or a Web API and create, for example, datasheets on the fly! If you ever want to create a data entry form or work with data sets, Groups will be the key to capturing and/or displaying that data. They are simple, convenient methods for formalizing a layout and producing something logical and intuitive for your users. Group's even support the notion of scaling so users can resize your datasheets or forms to improve readability. If you haven't tried out Groups, now is the time! As always, if you have any questions, don't hesitate to contact us.